I’m going to wait a few hours just to see what success people have downloading it! What about you guys? Just_Me_D, Frehley and ladyc0524 like this. Installed fine for me just like 5.1 did. Annie_8plus and Not Quite Right like this. I’ve got 95% battery remaining, and I have to stick it on the charger. I am waiting at least a few days. 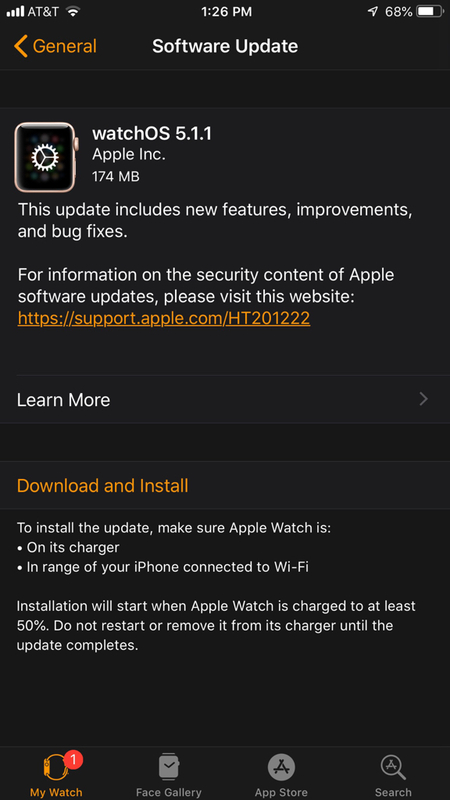 I am sure that this update is fine, but, without the user ability to recover from a bricked update, I will always wait on the watchOS update. Installed and runs well. Took about thirty minutes altogether. Successfully downloaded... it took about 45 minutes here at work, where my wifi connection isn't the best! I don’t see it either. Apparently this release is not part of the beta program. Apple will release a beta update soon. Downloading on my Series 4 now. Did not have the 5.1 installed so this seems a little slow. 50 minutes already and just now "Preparing"... fingers crossed! Installed on my Series 2 with no issues. Took 53 minutes start to finish. Normally I wait to update but I figured surely Apple wouldn't goof on an update 2x in a row and thankfully I was right. I’m nervous I don’t need another Apple device to die on me within a weeks time. I’ll wait. Downloaded no issue.... When do we get the ECG app? That’s a wise choice. But it’s my understanding that this update fixed that bricking. Will install when I get to work. Heading out the door to vote. Got it. Working fine so far. Series 3 LTE. Still getting delayed notitifcations on watch, sometimes no sound. Checked all settings, all is well, but this version is causing some issues for me. Installed last night no issues on my S4 going from 5.1 to it. Also my wife's S4 going from 5.0 to the new update. @nikkisharif did your watch get bricked by 5.1? Or did something else die on you? The 5.1.1 loaded quickly over the 5.1 I had successfully or luckily installed on my S4 before it was pulled. One improvement: I can now add Find Friends as a complication on the new 5.0 watch faces. When will Watch OS 5.1 return to availability? What is the certain technical component inside the ambient light sensor?